With the E6420 and E6320 getting 4MB L2s, there's now room for a lower end Core 2 Duo SKU with a 2MB L2 cache again: enter the Core 2 Duo E4000 series. Due to launch this month, the Core 2 Duo E4300 will eventually be followed by the Core 2 Duo E4400 (released in Q2). Both are dual core offerings like their 6000 series siblings, but differentiate themselves by only featuring a 2MB L2 cache, lower clock speeds, 800MHz FSB and feature no support for Intel Virtualization Technology. However, given that VT isn't anywhere near being a mainstream requirement, the E4000 series ends up being a cheap way of getting Core 2 Duo performance. The E4000 series is based on Intel's Allendale core, not Conroe, so there's physically only 2MB of cache on the die itself (not 4MB with half of the cache disabled). The end result is that these chips are cheaper to make, cooler running and should be pretty overclockable. The E4300 will launch first at 1.80GHz (200MHz x 9.0), followed by the E4400 at 2.0GHz (200MHz x 10.0). Since the clock multiplier is fixed at 9.0, the only hope for overclocking is by increasing the FSB frequency. With such a low default clock multiplier, you can actually overclock the chip pretty easily. 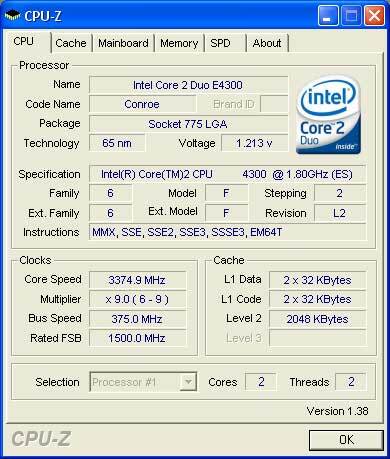 Using Gigabyte's GA-965P-DS3 motherboard, our engineering sample was able to run at 3.375GHz (375MHz x 9.0) at 1.468V using a stock Intel cooler. Although the E4300 still only has a 2MB L2 cache, when overclocked to over 3.3GHz you end up with a chip that's faster than Intel's Core 2 Extreme X6800 - at only $163. The E4300 gets even better in Q2 when its price will drop from $163 to $133, making it even more of a bargain. Today's review will focus on the overall performance of the E4300 at stock speeds as well as when overclocked. At stock speeds the E4300 is priced as a cheaper alternative to the Core 2 Duo E6300 and AMD's Athlon 64 X2 3800+, thus the comparison between those two chips is obvious. When overclocked however, the E4300 can hang with the best of the best and thus you'll see comparisons all the way up to the X6800 and Athlon 64 X2 5000+. We wanted to showcase the performance potential of the E4300 without resorting to more expensive 1066MHz or faster memory and thus we used a 2:1 memory-to-FSB ratio at stock speeds (DDR2-800) and 1:1 ratio for overclocking, resulting in our memory running at DDR2-750. With more expensive memory the overclocked E4300 would perform even better but our focus was on best bang for your buck with the chip and how well it can overclock. As you will soon see, you don't need anything faster than DDR2-800 memory to make the E4300 a very compelling chip.